Cracking Up. Clogwyn Du. Wales. | Great Escape. Nick Bullock. Nick Bullock and James McHaffie. 2nd March 06. On the 1stMarch 06, Libby Peter and myself returned to Clogwyn Du after making the first winter ascent of Travesty two days previous. 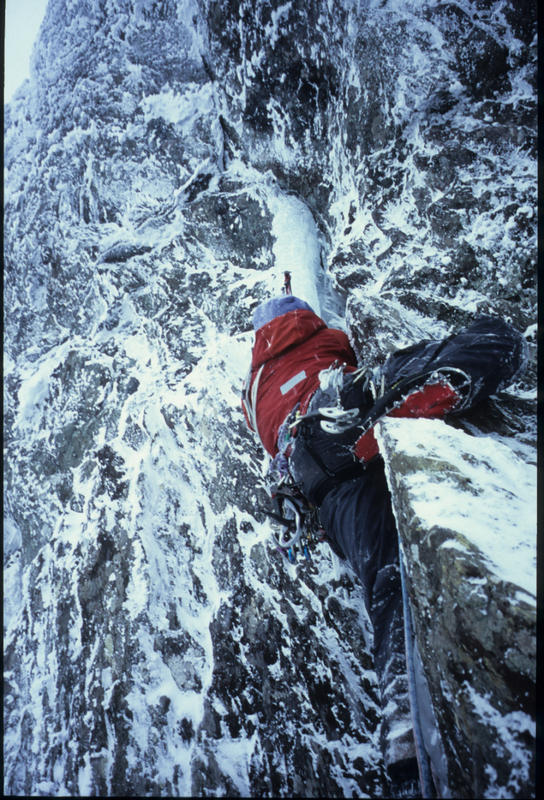 We were hoping to make the first winter ascent of the Crack, an E15b with 2 points of aid. The Crack is an intimidating, severely overhanging flared flake that turns into off-width. A direct start had not been done in summer, and the climb had not had a winter ascent. An icicle hung directly from beneath the crack, nearly touching the ground. Climbing the icicle using torques between the ice and rock, the only gear I could find were poor driven ice hooks. At the top of the icicle, a number 1 wire was placed. The ground was very steep, with few footholds. Attempting to use the icicle caused it to brake and sit in my lap, before crashing to the ground. Moving into the base of the crack was exceptionally steep with only smears for feet. A cam was placed. Insecure-laybacking while smearing feet on the right wall level with my head was very strenuous. While attempting to pull right onto an arête, to reach the small grassy ledge that is described in the Crack description, the left axe pulled and I fell. Exhausted from the effort, I had been climbing for approximately 1 hour, we left leaving the wire and cam in place. Returning the following day with Caff, 2 attempts were made to reach the grassy ledge. Both ended in falls. I returned to the ground on each occasion, but left the ropes clipped. On the 3rd attempt from the ground I made one move higher up the crack on a head of the axe and shaft torque enabling a thank god hook to be reached and at last, the grassy ledge. This did not give the resting spot I had hoped, but yielded several pieces of gear. Pulling into the bottomless groove of the upper section of the crack was more strenuous than anything below. Insecure head of the axe and shaft torques were used, feet were smeared…nubbins teetered, while fully committing to the placements. On smears, with feet at head-height, a savage pull on bending axe shafts was made. A small chock was hooked with both picks and after one more head of the axe torque above the chock, I crawled into a small pod. The pod offered very little rest. Fortunately there was a bomber hook at the back, which enabled a calming period and the placing of gear. Leaving the pod was once again a desperate struggle. Overhanging, insecure, shaft-bending torques, smearing feet and body tension. A cam placed from the pod was the only gear. It was impossible to stand while smearing and look into the crack. I was expecting the placements to rip at any moment, so the only answer was to keep laying away with vengeance while running feet up the right wall. Tiny blobs of rock on the left edge of the crack were used on occasion for the left foot, a moment of recuperation from the mayhem threatening to blow my head apart. Nearing the top of the crack an axe ripped and I fell, stopping level with the grassy ledge below the pod. Pulling back into the pod, the upper section was tackled once again, resulting in success. The last few moves of the crack, before grovelling on to the top of the flake a gibbering mess and constructing a belay, was probably the crux of the climb. I must admit Caff’s appraisal of the climb pleased me. Caff is no slouch when it comes to climbing. I led the second pitch, which was thankfully easier than the first but still a technical grade of 6, with a sting in the tail. Traversing the top in glorious sun we reached the bags, left at the base of the climb at 4pm. Five hours of utter madness. We needed to run as Caff had already missed one climbing session he should have been instructing.